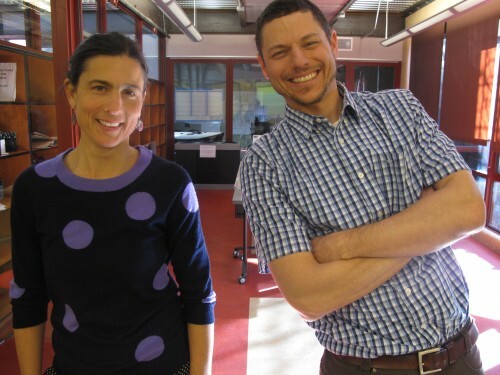 Solutions Lab Cohort 1 Facilitators; Sarah Ghiorse and Adam Rubel in Santa Fe, NM. Tell us about how the Solutions Lab programs works with Funding Start-Ups? Solutions Lab is a program designed by Kindle Project in response to the challenges faced by communities, stimulating the earliest stages of creativity through micro-granting, organizing a cohort to activate collective impact around a particular issue, and offering ongoing structured support to develop solutions. How do you do your funding? Describe your approach and process, explaining how it is different from conventional philanthropy. Our Solutions Lab funding approach is unique in several ways. First, we invite our community to submit new ideas in their most raw form. We have an open solicitation process with very flexible requirements, which enables us to receive new ideas that do not necessarily have a proven track record from the broader community beyond non-profit organizations. The opinions and feedback of the broader community are included in the decision-making process. Once accepted into the cohort, the micro-grants are given to participants without any other stipulations or reporting requirements, which is a departure from typical grant making procedures. In addition to financial support, Kindle Project invests their time and expertise in developing the ideas. There was a moment when your story began. How did you come to practice philanthropy in this way? Were you influenced by another organization, model, or funding philosophy? What made you realize this funding style would be important for what you were trying to achieve? I have had a long interest in the collective development of social benefit ideas, specifically in the experimentation, the willingness to experiment, and in developing unproven ideas. Our story began when I attended a fire-making workshop, where we used only a bow drill and a piece of wood to make a fire. In the process, a lot of effort was required to make the first spark. What was essential was creating the right conditions to nurture the ember into a flame. That process was very informative for me. Start-up ideas are like that little flame. Sparking them alone leaves the ideas vulnerable. Engaging in the process or tending the conditions for the flame to thrive gives them a greater chance to ignite a bigger fire. This process most closely draws from the recent trends of incubators and accelerators coming out of the tech sector, and now spreading across many different sectors, as well as developmental processes using storytelling, such as the work of Marshall Ganz. Another part of the inspiration is thinking about how to leverage the opportunity and impact of micro-grants, and how to address narratives as a fundamental leverage point. I would say the biggest challenge is the question of scale, and how can inspiring new ideas at a community level have an impact on global issues. In other words, why are we supporting start-ups that work at a community scale versus a global scale? The concern was that stories are irrelevant in addressing bigger issues and that a community scale is irrelevant. The response is that stories and narratives already shape our worldview and give rise to the problems we’ve created. Without drawing a contrasting story, we can’t recognize the embedded narratives. Community scale is where people and ecology exist, so that is where solutions need to come from and be implemented. There was a challenge in the emergent and experimental nature of this as a pilot project that came up in several forms — from identifying which projects would be the right fit for the cohort without knowing how it would unfold, to modifying the curriculum and process of the cohort to respond to the emerging needs and opportunities of the group. The lesson is to remain in a constant state of learning and adaptation and be willing to both continuously recognize the potential that we seek to catalyze and be flexible with what is needed in the moment. Innovation and creativity are the elements of this approach that traditional philanthropy often lacks. Funding in this way gives the opportunity to discover something new that can open a pathway that didn’t exist before. I think it leverages an impact that’s more deep than wide, but also allows for broader impact to emerge in unforeseen ways. The most important insight I gained was that our communities hold a tremendous amount of creativity and potential to address the problems that they face, but that creativity needs to be supported and nurtured in order to develop. I would tell someone who wants to do something similar to embrace risk and the unknown because that is where the greatest opportunity lies. Be willing to sacrifice linear outcomes for emergent learning. It provides a vehicle for stepping into the edge space where transformation becomes possible, where alternative pathways can be blazed, and an emerging potential can be catalyzed. The gift comes in the personal challenge of being able to find comfort in the unknown. Solutions lab helped Kindle to identify itself as a part of this community, as a part of stimulating thinking and conversation that empowers our community, and in gaining the confidence that we can really walk our talk in being bold and experimental towards creating a strong positive impact.